We have very kindly been given some photographs and postcards of Drayton, mostly of the Dabinett family who lived at Whitecross. Jesse Dabinett married Emma Lenton in 1891 and they had five children – Edward, Elizabeth, Philip George, Ida and Agnes. This is a photograph of Jesse with his son Edward. Could this be going down towards Midelney? Notice the car in the background. Could this be Edward? He married Nellie Dare. 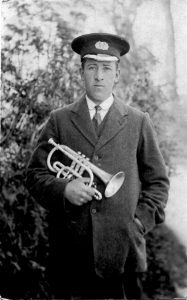 Edward lived in Drayton and died in 1962. 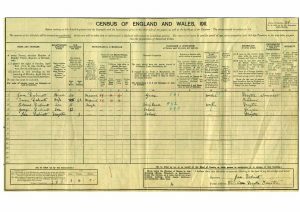 1911 Census with Jesse, Emma and their family. Please get in touch if you have any more information. 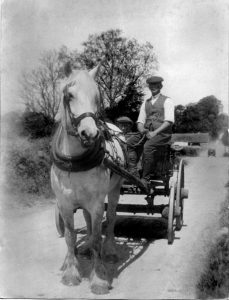 Drayton Remembers is a group run by people in the village with the intention of forming an archive of Drayton and its inhabitants, using photographs and stories from the past, for future generations.